We offer to you an assortment of cured pork and cheeses, produced in Alto Adige, when simply the prescriptions were following our grandfathers, with traditional methods and with the guarantee of typical quality of our people. 1 salami of the type hunter Luganega, about 200 gr. 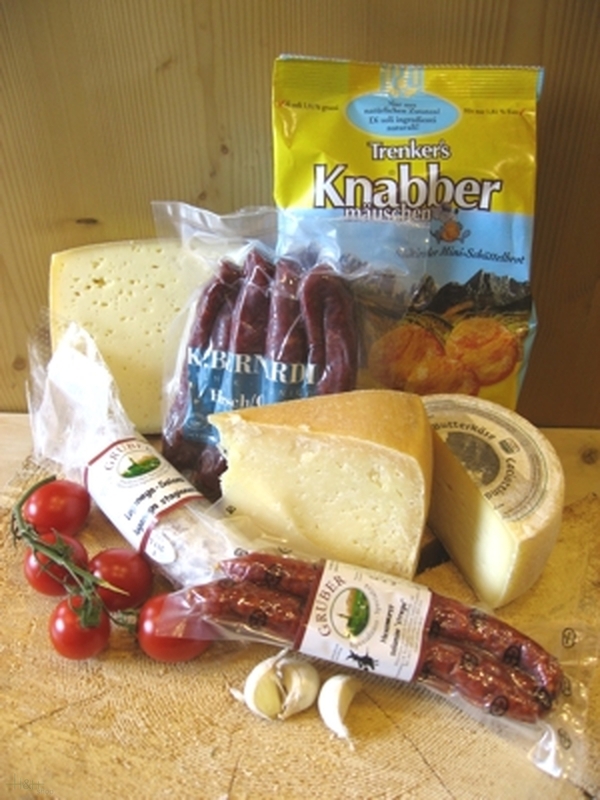 1 bag of bread of ryes Knabbermäuschen Trenker 200 gr., (characteristic dry bread, perfect with cured pork and cheeses or with a glass of wine). Convince yourselves! Present an assortment of cheeses of Alto Adige, choosing those most pleasant, those more delicate to those with a more decided and persistent taste. The single cheeses are cut fresh on the order and are posted vacuum-packed, so to guarantee a certainty in the transport and the possibility of conservation for a period of time up to 45 days. Our cured pork come all the butcher's shop Gruber, little but renowned company, that of generation in generation work following always and exclusively the original prescriptions of the craftsmen of a time, in the way of being able to offer traditional and genuine products. For the joy of the palate, we advise You the smoked sausages of deer, able to satisfy even the most exacting gourmets, or, it anchors, you try the "sausages of the witch", with their delightfully spicy taste. If you want to remain on the traditional tastes, you taste our salami cacciatorino, produced when the traditional prescriptions were following our countrymen. Great taste and sensational deal. Really pleased of my purchase. Great taste and sensational deal. Really pleased of my purc ..